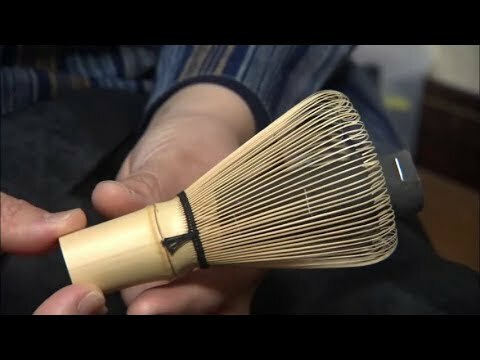 Highly Skilled Bamboo Crafts Unique Traditional Techniques –Takayama Tea Whisks (Chasen). For 500 years, the techniques of Takayama chasen were passed down from father to one single son in Yamato Takayama only. Tea ceremony is one of Japan's famous cultural traditions. It is the entertaining of guests with green tea, following a traditional, set pattern. There are two basic varieties of tea ceremony: "koi cha" and "usu cha". Originally, koi cha was a formal style, with usu cha being a simplified, more common version born later. In Ikoma, Kubo is a very common name, and number of chasen manufacturers bear this name. Bamboo considered good for chasen is said to be that taken from the mountains of Hyogo, Nara, Kyoto, and other areas on the Pacific Ocean side of the Kinki region. This is because the soil in that area is low in nutrients, causing the bamboo there to grow strong and be perfect for making sturdy chasen. That Edison used Japanese bamboo for the filament of the world's first light bulb is well known, but in fact that bamboo was madake bamboo from Hachiman City in Kyoto, very near Takayama. Next, the bamboo is progressively halved with a large knife and divided into sixteen pieces. With a small blade, the bark is separated, and the interior snapped off and removed. The sixteen segments are alternately divided into large and small segments to make the number of tines required for the intended purpose and school. The ends of the tines are boiled in hot water and placed on a stand, then thinned from the base to the tip. Varying the carving method according to the chasen's shape, after carving to the right thickness the tips of the tines are bent inwards to create a tapered brush-shape. It is said that the flavor of the tea changes depends on the ajiーkezuri stage. It is the most difficult, important stage, and a test of the craftsman's true worth. One by one, the thick tines of the carved chasen have their corners worked until they are smooth. This prevents the tea sticking to the tines during the tea ceremony. The beveled thick tines are raised and bound with thread, spreading them while leaving the thin tines in place. Another layer of thread is added to securely fix the base. The inner tines are gathered in the middle with a bamboo spatula and arranged to fix the size of the chasen, and the heights and intervals at the roots are made uniform. The bends in the tips of the tines are corrected and arranged into their respective shapes, and the lengths of and the intervals between the tines from the roots to the tips are adjusted.